Monday May 31st 1909 The men came to work this morning and took the stairs down and moved them to the new hall so we went up before four oclock. I did the washing in the forenoon and was very busy all day. We are not quite satisfied with the way the windows look in the new hall and will have one changed. Tuesday June 1st 1909 I ironed and did baking this morning. We got a letter from Lydia at noon saying Joe Duncan was dead and would be buried at Deloran tomorrow. We both went to town in the afternoon. I went down to the lumber yard to select front door and stair rail and post. I hurried home and got things ready for Will to got at 8.12 [Celora?] came out to stay with me. Charlie Hedges one of the windows in the hall. It is 22 years today that [Ilt?] and Fannie were married. 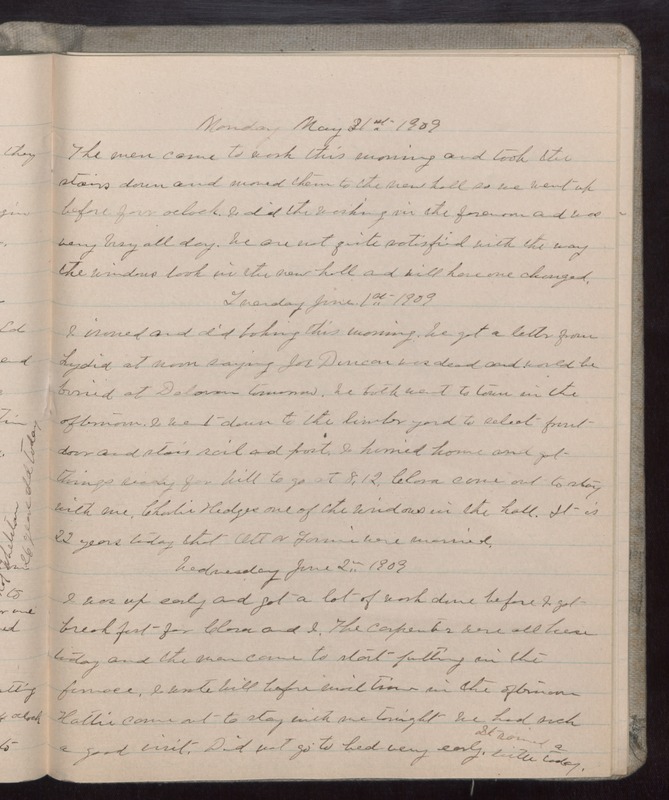 Wednesday June 2nd 1909 I was up early and got a lot of work done before I got breakfast for [Celora?] and I. The carpenters were all here today and the man came to start putting in the furnace. I wrote Will before mail time in the afternoon Kathie came out to stay with me tonight we had such a good visit. Did not got to bed very early. It rained a little today.